I always knew that the rest of my story is gonna be a good one. I don’t know how I knew that, but I always did. Ungow! I am Fester the cat. Welcome to my book, everyone! 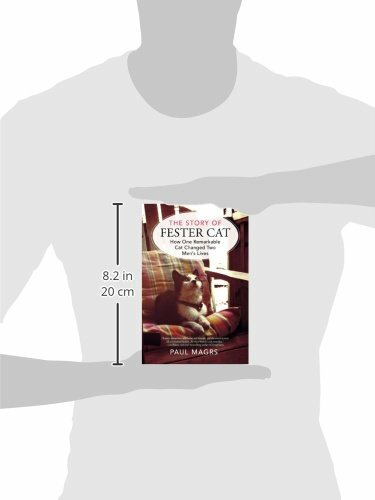 From when he first ambled into Paul Magrs’s yard—skinny, covered in flea bites, and missing all but one and a half teeth—Fester knew he’d found his family. Paul and his partner, Jeremy, thought it was the ragged black-and-white stray, tired from a rough life on the streets, who was in desperate need of support. But clever Fester knew better. He understood that it was his newfound owners who needed the help. Over the course of seven years, the feisty feline turned the quaint Manchester house into a loving home. Through his fierce spirit, strong will, and calming energy, Fester taught Paul and Jeremy how to listen and breathe, how to appreciate the joys of simply sitting and singing (what Fester’s purrs sounded like to his silly humans), and how to find joy and contentment in life, even when dealing with hardship. This is the true story of an extraordinary little cat whose gentle charm and trusting soul turned two young men into a family.